Patrons send their headshots via an online messaging app to the barista and are given the choice of either a cappuccino or hot chocolate as their canvas. The image is uploaded to the “Cino” machine while the drink is placed in position. 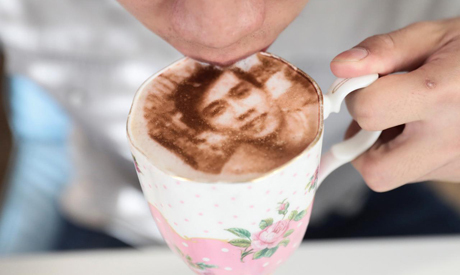 The picture is then scanned and reproduced onto the froth using a flavorless food coloring. Over 400 of the personalized drinks have been sold since they launched on Saturday, with the hash tag “Selfieccino” going viral across various social media platforms. The Tea Terrace hopes to trademark the term as they expand the service across their other two locations in London Victoria and Guildford, Surrey.